Improve your bottom line with wet, whole kernel fractionation. Learn more about the HydroMilling process from AMG Engineering. The co-products provide healthy, nutritional benefits to their consumers and enables “food and fuel” production. With wet fractionation, starch yield loss is minimized compared to “other” fractionation processes resulting in higher quality germ and fiber. With greater starch recovery, ethanol yield per bushel is higher. Generate less pollution than either a conventional whole kernel dry grind, or a conventional dry fractionation facility. Greater revenues and greater net profit. No SO2 is used, so 316 stainless steel handling equipment is not needed. Wet fractionation solubilizes nutrients from the germ, which benefits fermentation. The Products For The Food Industry Are Marketed Under The Brand Prairie Sky® Ingredients. 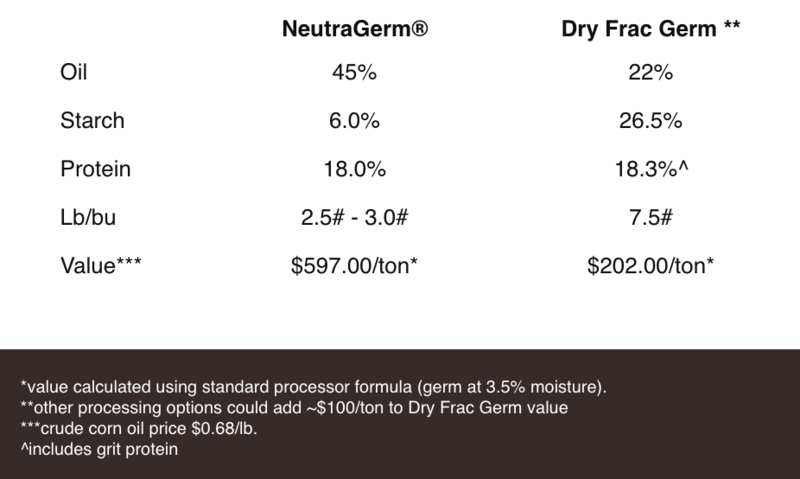 NeutraGerm® is produced using no SO2, and the germ has no bad odor. The low temperature drying system, delivers a high quality, low moisture (3%), food grade product. Low residual starch levels maximize product oil content. WholeBran™, a food grade fiber product. Due to the unique process, this product has low residual starch, high TDF and a neutral taste profile. The Solaris® Brand Of Ingredients Are Sold Exclusively To The Feed Industry. ProBran® – a highly digestible source of fiber, ProBran is a very palatable, high fiber option. Low dust, ProBran is very flowable. Energia® – with a higher protein level than DDGS, Energia is a pelleted, low-fat ingredient that is extremely digestible and can be used in higher concentrations for both ruminants and monogastrics. Energia is also low in phosphorus, low in potassium, and low in moisture. Energia is a very palatable and highly digestible source of critical nutrients. Glutenol® – this concentrated source of amino acids is low in phosphorus. Unlike corn gluten meal, Glutenol is SO2 free. Very low in moisture, low dust and flowable, it mixes easily. The high carotenoids content creates a desirable goldcolor for eggs and poultry. Glutenol® XP – similar to Glutenol, this product has even greater concentrations of highly digestible essential amino acids, energy and carotenoids.